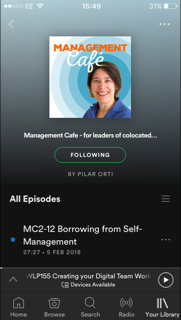 In October 2018, Pilar participated in this event for professional facilitators in London, organised Chris Helm, Martin Tothill (check out Meetup for future sessions of this great group), and was inspired to create this quick bonus episode to share her thoughts directly after it. Many issues were explored, including how does facilitation differ in the online space, compared to the colocated/face-to-face one? Because the range of options in the online (or partially online/hybrid space) is vast… But it also creates more possibilities, when we’re not constrained by the limits of a physical space. And we can replicate many of the qualities of face-to-face group-work, with just a little bit of thought and planning. Managing expectations is vital, and that includes clarification of the facilitator’s role (see episode 177, for much more input on this), ensuring our contract with participants is clear, as well as our relationship with the tech we’re using (which we must have real mastery over). Ceding power to the group on this can be messier – do we mute by default or not, for example – but if you can do so, it creates a richer learning experience. Ultimately, it’s about what most benefits the group that the facilitator is there to serve. So much we can learn, for online meetings generally, and making sure we are connecting both individually and collectively in a productive and effective way. Lots of high-level thoughts emerged in this session, and this spontaneous bonus podcast episode – complete with rustling flipcharts and passing traffic – will be of interest to anyone dealing with online communications as a group.